As one of the most important figures in 20th century Chinese art, Zhang Daqian (1899-1983) was a master of an astonishing range of styles and techniques. 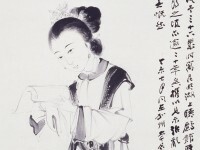 His reputation rests not only on his encyclopaedic knowledge of Chinese artistic traditions and his remarkable technical skill, but also for the volume of his work and his ability to produce paintings that were often huge in scale and conception. Even in his later years he was bold in his use of ink and colour. It was in west China during the Second World War (1939-1945) that Michael Sullivan (1916-2013) and Zhang Daqian met and became lifelong friends. This painting together with the inscription at the top, were completed in 1935. The inscription includes a ci poem by the Song Dynasty (AD 960-1279) author Xin Qiji (1140-1207) which ends in ‘Jiaxuan’s ci poetry in the tunes of Manjianghong”. The image here illustrates the poem, which describes a lady reading a letter from her lover and missing him. This work was painted when Zhang was following the Ming Dynasty (1368-1644) style and techniques. He was also influenced by Qing Dynasty (1644-1911) artists such as Tang Yin (1470-1524), Chen Hongshou (1768-1822), and Gai Qi (1774-1829). The painting was first acquired by Geoffrey Hedley (died 1958) who then bequeathed it to Khoan (1919-2003) and Michael in 1960. Zhang saw this painting again in Michael’s house at Stanford in 1967 and dedicated the inscription on the right to him, commemorating their friendship through years of wars and social changes. The inscription reads ‘This painting was done when I was 36 years old and licing in the Tingli pavilion on Kunming Lake. My old friend Michael acquired this painting in Chengdu nearly 20 years ago. [Now he] brought this painting and showed it to me again. Life has been full of uncertainty and social upheaval. I cannot help but sigh with emotion even at this moment of our happy reunion. [Inscribed] in the seventh month of a dingwei year  when in California together [with Michael] by Daqian Jushi, who is nearly 68 years old.’ This inscription shows that Zhang mistakenly thought that Michael had acquired the painting early in the 1940s in Chengdu.